Rhoda Abbott was a survivor of one of the most tragic maritime disasters in history, the sinking of the R.M.S. Titanic in April of 1912. Rhoda Abbott, better known in Titanic lore as Rosa Abbott, never actually used the name Rosa. The White Star Line passenger manifest is the only instance when Rhoda’s name was ever written as Rosa. Her birth certificate, marriage certificate, census data in the United States and England, passport information, and death certificate all have a given name of Rhoda. How interesting that the notoriety of the Titanic disaster and the misspelling of her name placed her in history as Rosa and not Rhoda Abbott. Therein, lies part of the reason that Rhoda was so elusive to researchers for so long. Rhoda survived the disaster physically and had the distinction of being the only woman to survive that fateful night actually in the cold water of the Atlantic. All the other women survivors were occupants of Titanic’s lifeboats. Rhoda survived physically, but suffered mentally for the rest of her life. She had suffered a difficult separation and divorce in 1911 from her husband, Stanton Abbott, a former United States middleweight boxing champion. Drained by the stress of the divorce and then the loss of her two sons in the Titanic disaster, a chronic asthma condition caused by her Titanic experience, and a relatively loveless second marriage which was plagued by sporadic unemployment and illness, and finally the care of an invalid husband for many years until his death in 1938, added further to Rhoda’s mental suffering. The final phase of Rhoda’s life was spent alone in war ravaged London during World War II. The passport pictures shown in the article reflect the internal anguish she dealt with her entire life. Rhoda Mary Hunt was born in Aylesbury, Buckinghamshire, England on January 14, 1873, the daughter of Joseph Hunt and his wife, Sarah Green Hunt. Her childhood was spent in Aylesbury and in later years in St. Albans, Hertfordshire where the family moved when Rhoda was a young woman. It was from St. Albans that she emigrated to the United States in 1894. She arrived in Providence, Rhode island and soon after married a professional boxer named Stanton Abbott, who was born in London and emigrated to the United States in 1893. The marriage took place in early 1895. This phase of Rhoda’s life was perhaps her happiest when Stanton’s career took off as he became the middleweight boxing champion of the United States. Two beautiful sons were born into the family- Rossmore Edward on February 21, 1896 and Eugene Joseph on March 31, 1899. Rhoda settled into a satisfying domestic life as wife and mother. She was an active and devoted member of Grace Episcopal Church in Providence during that time. She doted on her boys and watched them grow into handsome and personable young men. However, Stanton’s success gradually caused a rift within the family, and by 1911 the marriage had deteriorated to such an extent that the couple had separated. Rhoda decided to return to England with her sons and live with her widowed mother in St. Albans, her father having died there in 1898. Sailing aboard the Olympic, she arrived in England in August of 1911. Rhoda supported herself as a seamstress, and Rossmore worked as a bootmaker. Eugene was a student at the Priory Park School in St. Albans. Life was not easy for the family in England, and the boys became very homesick for their former life in the United States. Rhoda realized that the boys were American, not English, and that they would prosper better in the United States with all its advantages, than in England. She bought tickets to return to Providence in April of 1912, and was elated when her accommodations were changed, due to the national coal strike in England at the time, from an older and smaller liner to the magnificent, gigantic Titanic, being touted as the “most luxurious ship ever outfitted”. The family traveled to Southampton by train and boarded the fabulous Titanic early on sailing day, April 10, 1912. After boarding, Rhoda and her sons found their accommodations in the family cabins at the far aft of the ship, and the boys took off to explore the huge ship as Rhoda unpacked clothing and prepared the cabin as their home for the next few days. Rhoda made the acquaintance of Amy Stanley, Emily Goldsmith, and May Howard who had cabins nearby. The voyage was quite uneventful with the boys roaming the corridors and decks of the huge ship and Rhoda passing the time by conversing with the English ladies in the adjoining cabins. The family had just retired for the evening on Sunday night, April 14, when they were awakened by a sudden jolt and then a dreadful squealing and scraping sound coming from the side of the ship. They knew something was wrong, but the boys sensed an “adventure” and wanted by go up on deck to find out what had happened. Rhoda preferred caution, and waited for a steward to some into the hallway and was assured that all was well and that she should go back to sleep. Much to their dismay, Rossmore and Eugene were pushed back to their bunks and tenderly tucked in for the night by their mother. About 12:15 A.M., Rhoda and the boys were suddenly aroused by a steward opening their door and shouting, “all passengers on deck with life jackets”. The real seriousness of the situation was not realized as Rhoda and the boys casually dressed and put on life jackets. They entered the crowded hallway and followed the human chain moving forward, passing through an opened watertight door which opened to a stairway leading to the deck above. They joined a large group of third class men, women, and children in the second class saloon area of the ship. Only women and children were being allowed beyond the gate standing before the group. Somehow, Rhoda managed to get her two young sons through the gate overseen by several crewmen. They next climbed a steel ladder onto the stern end of the boat deck and were led slowly forward, moving carefully so as not to trip over discarded ropes and debris remaining from the previous launchings of lifeboats there. Meanwhile, as the group edged forward, the last of the distress rockets was fired from the bridge area of the ship. They finally reached one of Titanic’s last lifeboats, Collapsible C, just as it was being loaded. Only women and children were being allowed through a group of crewmen responsible for loading this boat, the last to be launched from the starboard side of the ship. Rhoda watched anxiously as Emily and Frankie Goldsmith, May Howard, Sarah Roth, Emily Badman, and Amy Stanley all were passed into the lifeboat. No men allowed was the rule, and she knew in her heart that her beloved sons would be left behind. As her turn came to enter the boat, her maternal instinct took over and she clasped her sons to her body and stepped back into the background on the boat deck. Amy Stanley remembered the sadness she felt as she watched Rhoda step back to join her sons and perish, if need be, with them. Collapsible C slowly scraped along the side of the Titanic into the dark Atlantic waters at approximately 2 A.M. leaving Rhoda, Rossmore, and Eugene standing on the sloping deck of the Titanic with the seawater inching ever closer and closer to their position on the deck. Meanwhile a group of crewmen had been frantically trying to launch Collapsible boat A, sitting atop the roof of the officers quarters. The lashings had been removed and the boat was in the process of being readied for boarding when Titanic made her final plunge. The passengers and crew waiting to board Collapsible A, Rhoda and her sons included, were swept from the deck instantly. The mother had just enough time to clasp her sons hands before they were swept into the maelstrom created by the sinking liner. She struggled to keep them with her- but to no avail. They were swallowed by the unmerciful sea. Struggling for her own survival and gasping for air, Rhoda tried vainly to locate her sons in the mass of humanity surrounding her in the freezing waters. Just as she was about to give up, a strong hand reached out and grabbed her arm. She was pulled into Collapsible A which was nearly swamped and riding low in the water with over twenty people either in the boat or hanging onto the gunwales. As the hours wore on, hypothermia took its toll. One by one, the dead were carefully lowered over the side. August Wennerstrom, one of the collapsibles’ occupants, later quoted- “All the feeling left us. If we wanted to know if we still had legs left, we had to feel down into the water with our hand. The only exercise we got was when someone gave up hope and died, whom we immediately threw overboard to give the live ones a little more space and at the same time lighten the weight of the boat. “ When Officer Lowe finally arrived in Lifeboat 14, only 13 had survived the nights’ ordeal- Rhoda being one of them. Following transfer of the living, Officer Lowe set Collapsible A adrift, leaving the dead on board. Rhoda was nearly unconscious during the transfer back to the Carpathia, but Lead Fireman Thomas Threlfall cared for her until she was lifted onto the rescue ship. Rhoda was semi-delirious for much of the Carpathia’s trip on to New York City, but her friend Amy Stanley gently cared for her. She soothed and comforted a distraught mother who could not comprehend the loss of her handsome young sons. Upon arrival in New York, Rhoda was transported to St. Vincent’s Hospital in Manhattan where she became one of the last survivors to be discharged. She lived with respiratory problems and severe bouts with asthma for the rest of her life as a result of her Titanic experience. Her life seemed to have come to a dead end- her reason for living had ended. Other letters to fellow survivor, Emily Goldsmith Illman and her son Frankie, chronicle her life during the period of 1912 to 1914. She had married a longtime friend, George Charles Williams, on December 16, 1912. He was originally from London and was born on November 20, 1875. He emigrated to the United States in 1906 and lived in Jacksonville, Florida most of that time. Though a silversmith by trade, he found jobs only in other fields of endeavor, and during most of their life in Florida was a bookbinder. It was decided that they would live in Jacksonville as the climate would be more conducive to Rhoda’s chronic asthma and respiratory problems. They lived at several different locations in the Jacksonville area between 1913 and 1928. In 1928 they were living at 33 West 18th. Street, their last address in the United States. In August of 1928, George and Rhoda left for England to settle his father’s (John S. Williams) estate in Barnes, Northeast Surrey, London. Shortly after their arrival in London, in September of 1928, George suffered a debilitating stroke which totally incapacitated him and left him an invalid to be cared for the remainder of his life. Rhoda dutifully cared for her husband for the next ten years, until his death on June 5, 1938. She was now free to return to the United States which had been her plan all along. property or other interests in the United States. It would seem that she gave up the attempt to return after this date. She continued to live at 47 Cleveland Road in Barnes, Surrey Northeast, London until her death due to heart failure as a result of hypertension on February 18, 1946. Her nearest survivor was a niece living in St. Albans, Hertfordshire with whom she had a distant relationship. Rhoda died a lonely old woman in a location far distant from the one that she wished to live her last years in. She had been cheated in life of all that she loved, and even in death was cheated on her one last desire, to return to her home area and friends and to spend her last years where she had found what little happiness she had in her adult years. She seemed to have developed a fatalistic attitude that kept her from really enjoying life beyond Titanic’s demise. 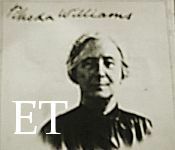 Rhoda Mary Hunt Abbott Williams certainly led a life unfulfilled due to her tragic Titanic experience. The author is treasurer and a trustee of the Titanic International Society.